I had no intention of posting again until I reviewed Texas Chainsaw 3D this weekend, but then I got gobsmacked by John Dies At The End last night. This was one of those increasingly rare instances in which I knew virtually nothing about the movie before sitting down to watch it. I knew it was directed by Don (Phantasm) Coscarelli, I knew Paul Giamatti was in it, and I knew it was based on a cultish novel I hadn't read. That's pretty much all I knew. It seems that viewer response to John Dies At The End has been mixed. Those familiar with the book grouse that the movie adaptation takes too many liberties with the source material and omits too many key narrative points. Those unfamiliar with the book seem (mostly) to love the movie. I'm glad - for now, at least - that I'm unfamiliar with the book, because John Dies At The End was the most fun I've had watching a movie in a long while. Now before I go on I must, in the interest of full disclosure, mention that my friend Adrienne - also unfamiliar with the book - watched it with me and loathed it. She characterized her viewing experience as "an hour and a half of my life that I'll never get back" and demanded to know why I hadn't warned her of what we were about to watch. Clearly, then, John Dies At The End will not be everyone's cup of tea, regardless of one's level of familiarity with the source material. Luckily, I was able to get back in her good graces tonight with a viewing of William Friedkin's Killer Joe, which we both enjoyed. 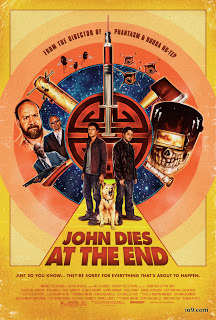 As indicated in the title of the post, this isn't really going to be a proper review of John Dies At The End because I wouldn't want to be the jackass who ruins the movie for you by giving away all of the "good stuff". 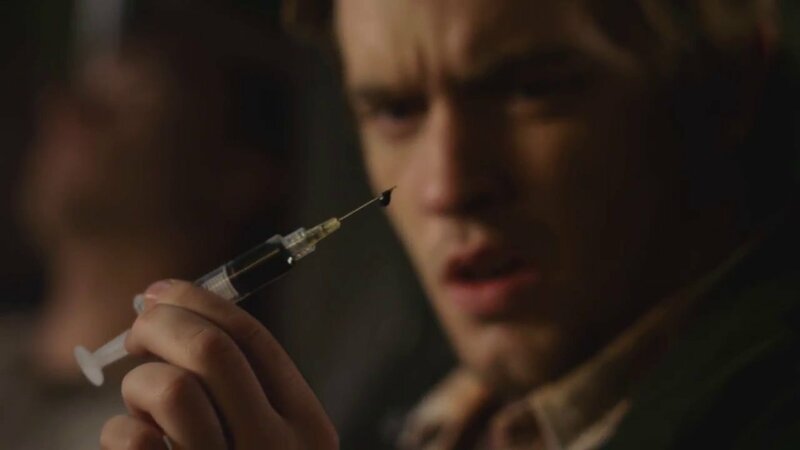 In a nutshell: college dropouts John and David are introduced to a drug called Soy Sauce that transports its users across dimensions and time, and that sauce just might leave its users a few clicks shy of human in the process. Obviously, this is all part of an invasion originating from another dimension. The fate of all humanity hangs in the balance. Though crafted on a modest budget, the cheesy effects suit the movie's tone perfectly. The CGI is a little dodgy, but the practical effects - supervised by Robert Kurtzman and Robert Hall - give up the 80's style latex and slime in glorious fashion. The "apocalypse on a budget" vibe invites favorable comparisons to Coscarelli's own Phantasm series, still my favorite genre franchise. 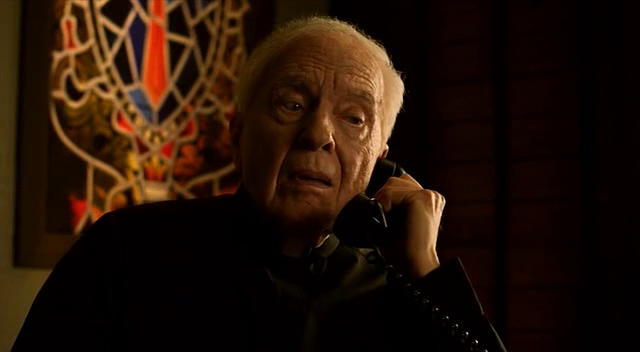 Did I mention Angus "The Tall Man" Scrimm's cameo? Please, guys, give us just one more Phantasm installment while The Tall Man still lives. Director Don Coscarelli and his cast are clearly having a blast telling this twisted tale, and the freewheeling absurdity of pretty much everything that happens is a delight. I was grinning from ear to ear throughout, and laughed out loud on more than one occasion. I don't often say this, but I can't wait for the sequel. Remember, though - Adrienne was not amused. I'm debating whether or not I should read the book now . . .
As a diehard Phantasm fan, I wanted more Coscarelli. Bubba Ho Tep was great, and the trailer for this looked amazing. Since you gave your argument, I most definitely will be making time for this film in the near future. I'll absolutely be giving this a shot now. The Phantasm series is one of my favorites so I was really hoping this would be good. Thanks for the info, I'll be making the time to see this one soon. Wanted to let you know, you part of the Alliance. Please stop by and check to make sure your link is correct. Remember to say Thank You and feel free to visit the other HBA Members. Also if you have "CAPTCHA" on, you might want to turn it off... people hate it, okay I hate it. Oh, No Let's Get CRAZY!